cyclofiend: San Francisco Randonneurs June Populaire - This Weekend! San Francisco Randonneurs June Populaire - This Weekend! Wow! Where did the time go? This Saturday, June 2nd is the (hopefully rain-free) running of the San Francisco Randonneurs' Summer Populaire. 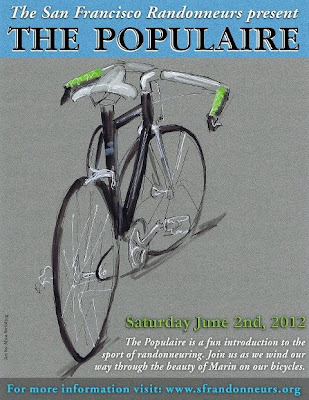 Please consider joining SFR for the Populaire on Saturday, June 2nd. If you haven't ridden with us in a while, this is the perfect opportunity to rejoin us. If you are looking for a ride to keep your momentum going between longer rides, this ride is perfect and will still leave you most of the afternoon for other events. Come on out and join us, and bring a friend or two. Newcomers to brevets and randonneuring more than welcome as well! You'll seldom find a nicer group of folks with whom to while away the time. It's a great way to learn about brevet cards and controlles and route finding/following.